The Grammy winning album "Simple Gifts"
What was so enjoyable about making the first full light album in 10 years? Many things, but recording at Status Quo founder Francis Rossi's house gave the whole thing a lift. He would occasionally come in to pick up a guitar or ask David to help with his crossword, and he was always amazed by what we were up to! Musically speaking it was fun creating something that cannot be put together outside of a studio. You've talked in the past about going to a studio and creating something from scratch that hadn't been written or rehearsed before you got there. The Spirit Voices album has tracks on it like that, for example. This time around the arrangements were basically all finished, but did some things change once you got there? Yes, a little. For example You Can Close Your Eyes by James Taylor started life as an arrangement very much like the original song. But having finished the first version we thought this beautiful song needed a bigger treatment, and during the last week of recording we hit upon the idea of making a second vocal part for it. That part was then actually the first thing to be recorded. When we got to the end of the day all we had was a load of oohs, aahs and hums which didn't amount to very much. But the following day we sang the top chorus, and having those second choir supporting parts in our headphones as we sang the text was very inspiring. By the end of the day we put the whole thing together and the studio buzzed with excitement. The album is called Simple Gifts, which suggests a kind of spiritual/folk element. What is the concept of the album - that is to say how does a James Taylor ballad fit with spirituals and folk songs like Black is the Color of my True Love's Hair? We spent a long time trying to decide whether we should record a pure folk or a pure pop album, and then gradually the idea dawned that there was something that combined the elements of both, and that is melody. A good ballad is really very much like a folk song, in that it has a strong melody. We simply chose songs that had beautiful tunes, whether they were written by King Henry the Eighth or Sting! We approached it believing there is no point at which folk songs end and ballads begin. A good example of that is Valparaiso,a song none of us knew until Emily Crocker from Hal Leonard emailed to say she would like an arrangement of it. She sent an audio file and we were amazed, because Sting has composed an original melody which could have come from many years ago. It's a fine concept, but melody suggests lots of solos. 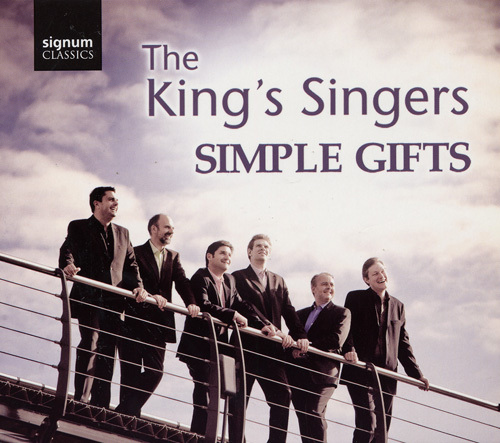 Is Simple Gifts an album of solos sung to backing? ...and I'm sure people listening will be able to sing along immediately. So both those pieces you just mentioned are basically transcriptions, and the better for it for the reasons you have just described. You've said that recording in a studio allows you to do things you can't do anywhere else. But are there any draw-backs to it? The studio experience is a two-edged sword, because you have all this technology at your disposal, yet you don't have the benefit of acoustics to give natural warmth to the sound. You mean it's difficult to sing in that environment? We were in Status Quo's drum room, pretty close up to the microphone, which made it difficult to sing because every little sound was picked up. Mouth clicks, pops, breaths, you name it... It was a bit like singing in a cupboard! What came out in the end belies the fact that the space was so small. How important is the producer/engineer in the studio environment? Well, we were really helped by our expert sound engineer Gregg Jackman, who worked with us on Good Vibrations and Spirit Voices - and he did an excellent job on both of those too. He seems instinctively to know what sound is right for which song. You can be in the booth singing your bit on a track and thinking 'I'm not feeling so good this morning, I hope this doesn't take too long', then he calls you into the control room and he's somehow brought the sound to life! We co-produced this album with him, and Robin and I really got into that side of it. It's hard to describe the quality of the sound. It isn't a reverb. This album has a newish kind of sound. If you listen to Good Vibrations and compare it with this album, the group sounds much more upfront on Simple Gifts. We started recording with odd days in October and November 2007, and finished with 10 days in January 2008. Obviously a day in the studio is not like a day in a normal acoustic recording session. In the last week of recording we were putting in twelve hour days. It takes a lot longer than you might think to set up the tracks and to get everything in the right place. And once the singing is finished, there is mixing to be done. Gregg does a lot of this as he goes along. We are lucky that Signum, our record label, doesn't pressurise us to work too quickly, because albums like this need a lot of studio time. The only limits we really had were with Gregg's schedule and ours. When it came to it we were able to work in a relaxed way and if we produced a 3-minute piece of music at the end of the day, we were happy! But we got slicker as we went along, and began to expect to finish two tracks a day, which was important because we had a tour to the USA looming, and we also needed to finish so that the disc could be released in time for our 40th anniversary concerts in May 2008. Turning to the arrangements: how many of your arrangements feature on this album? And how many of those are new for this album? Specifically for the album are Valparaiso, April Come She Will, When She Loved Me, and You Can Close Your Eyes. The latter I discovered by accident. The first of 2 flights on a US concert day (Feb 6th, 2007) was late and caused us to miss our connection. Paul suggested we hire cars and drive from Washington DC to State College Pennsylvania. Half way along the 4-hour journey we stopped at a Starbucks in the middle of nowhere to get coffee and change drivers, and I noticed a new Carly Simon disc for sale called Into White which had this song by her ex-husband James Taylor as one of its tracks. We continued our long drive and put the CD on, and as soon as I heard You Can Close Your Eyes I knew I had to arrange it for the group. Of the other songs The Water is Wide was done before I joined the group, and was originally a 4-part arrangement. In 1995 I expanded it, and it was the first arrangement of mine the group performed. I followed that up with The Turtle Doveand I Love my Love, so they are not new but haven't been recorded before. We all admire the skill of Billy Joel, and have been singing She's Always a Womansince Chris joined. It always goes down very well, especially as it features his lovely velvet voice. How do you pick pieces - what has to click in your head to think 'Yes that would make a great arrangement'? What really does it for me is if I like the song. I arrange music far better if I like it, as the ideas come very quickly. It doesn't have to be a song which when hearing the original you think 'Ah that as it stands would sound good as a King's Singers song', it's better when you feel something fresh can be added to the song. Well let's take an example - When She Loved Me. How did that Disney song enter your conscience? I had already done a Disney song from the original Toy Story movie - I Will Go Sailing No More, and what inspired that was David's performance of Texas Girl at the Funeral of her Father which is also by Randy Newman and on the Good Vibrations album. There is something very poignant about a countertenor singing a sad song. When She Loved Me is sung by a girl in the movie - Jessie the cowgirl - but she is talking about her female owner, so it does work as a male lead. My children have the movies on DVD and love them, but it was actually Stephen who suggested When She Loved Me specifically. We were expecting to record I Will Go Sailing No More,but Steve said 'What about that other one..?' and I knew immediately which one I would prefer. We were in Holland at the time and I went straight to the piano and did the introduction. The rest of it was easy because it's basically close to how it is on the movie soundtrack, with a few extra spicy chords thrown in. <FONT COLOR="#000000">Can you put into words a stylistic difference between you, Bob Chilcott and Peter Knight - the other two arrangers on this album? There is much more of a similarity between me and Bob Chilcott. Peter Knight wrote for the group in the early '70s, and his style is very much to do with textures. He writes some advanced chords, and has a beautiful harmonic structure to his arrangements. They are real classics and the two we have got on the album - Swing Low, Sweet Chariot and You are the New Dayare good examples of his style. Bob works more on the ostinato principle. He'll get a pattern, like in Greensleeves, Steal Away or The Gift to be Simple on top of which the tune sits. I was in the group with him for 3 years and learnt a lot from him in terms of arranging. I Love my Love has an ostinato doesn't it? Yes, exactly, and I arranged that while Bob was in the group, looking over my shoulder! The album is coming out in The King's Singers 40th anniversary year. Is it a good birthday gift? Is it representative of the group now? It makes a great birthday gift to our fans, but isn't representative of everything we do now. The variety of our repertoire comes across more fully in our recent Byrd to Beatles DVD. Over the last few years we have recorded many classical albums so we all thought it was time to redress the balance. These songs are going to enter the repertoire and refresh the close harmony section of concerts and the content of masterclasses that we give, because the music will be published in a Hal Leonard book in the autumn of 2008. And so before long you will be enjoying groups from around the world singing these songs to you! Yes, and perhaps we'll even be singing with them! We love performing You are the New Day with the second choir part, and the James Taylor song should work well like that too.